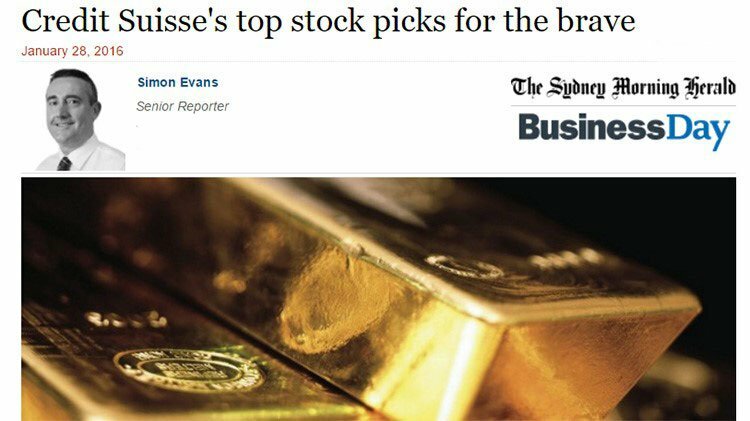 One ASX-listed explorer whose drillholes hit mineralisation 80% of the time, is exploring a frontier destination where it is literally helping to write the book on mining. This company is fully funded for exploration until it declares a maiden resource early in 2016 and a Scoping Study beyond that, eliminating the need in the short term to go to shareholders for more working capital. 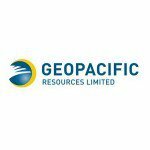 The company we’re describing is Geopacific Resources (ASX:GPR), one of the lesser known emerging explorers with near term production on the cards, currently capped at around $40M. GPR has coolly and calmly moved through the phases of early-stage exploration, with drilling firming up resources and adding new resources onto the plate. GPR is an early mover in Cambodia, a country that has had very little minerals exploration until very recently. Whilst this could be considered attractive, at the same time, operating in Cambodia does carry added political risk, and GPR is a speculative stock. Recent announcements put out by GPR have been some of their best to date, including 28m at 4.34% Cu eq. at Prospect 160 , which UBS awarded them ‘ Drill hole of the Day’ for. 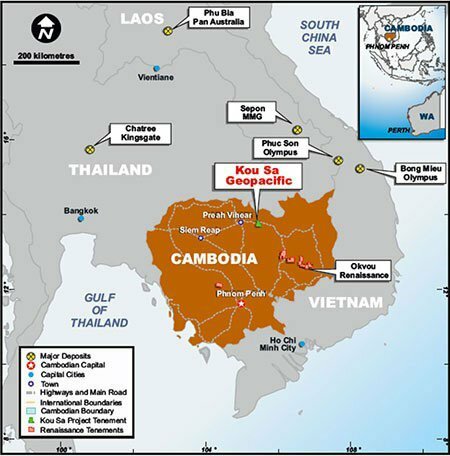 Geopacfic Resources (ASX:GPR) is an emerging copper-gold explorer looking around in one of the few unexplored countries on earth in Cambodia, with GPR gaining an early mover advantage in the country. Its project, the Kou Sa Project, sits in the north of the country near the borders of Laos and Thailand. The company is planning on this project to grow into the first metals mine in Cambodian history. The project is a joint venture between GPR, which has an 85% stake and the Royal Group, a Cambodian conglomerate with the local connections and know-how to assist GPR along the way. The team at GPR have successfully built 8 mines, in 6 countries from exploration projects – and are looking to repeat their formula again with GPR in Cambodia. In addition to the Royal Group, GPR also has other major partners on board, with two specialist resources funds in Resource Capital Funds and Tembo Capital Mining Fund taking a combined 53.8% in GPR as part of a $23 million placement deal done at the start of July. Meanwhile Tembo has a strong technically oriented team of investment and mining finance professionals with a long association in emerging markets. Both have now backed GPR to do great things. The $23 million deal means that GPR is fully funded for exploration through to next July, meaning there’s very little prospect GPR will be going to market for more cash in the short term. The cash will be used to fund exploration at its various prospects as it moves towards confirming a maiden JORC resource early next year and completing a Scoping Study for the project. But recently GPR’s work has caught our eye again – let’s find out what the company has been up to recently. GPR’s project itself is broken up into several prospects. Most of the attention to date has been focused on Prospect 150, and is listed as the most advanced prospect of the bunch so far and is expected to provide the base for the JORC resource, along with Prospect 160. Along with results of 5.5m at 4.22% Cu eq. 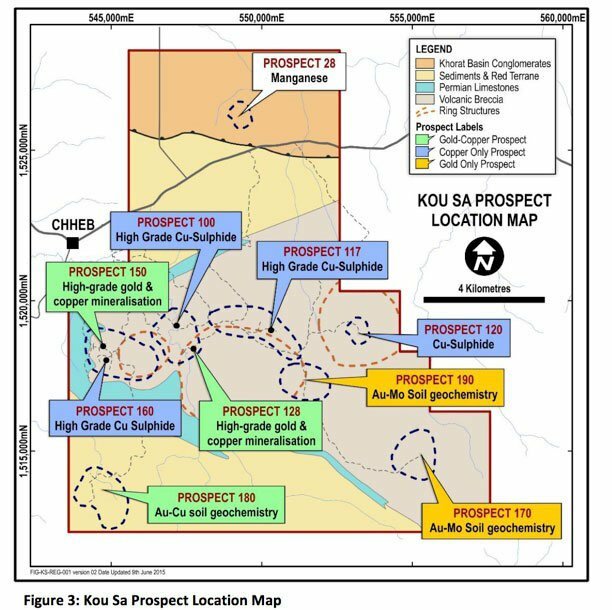 , GPR announced that its strategy is to release an initial maiden resource and Scoping Study for Kou Sa in early 2016. This is seen as a ‘kickstarter’ to take the project into production on an efficient path. At the same time, GPR will continue exploration, looking to continually increase the overall scale of the project well beyond the initial resource. The intention is to develop a project that’ll generate revenue to support expansion. The drilling at Prospect 150 has also found high grade mineralisation, with drill results including 5m at 128.64 g/t gold and 4.01% copper. But Prospect 150 is not all there is to GPR’s Kou Sa Project. The results and geophysics along the 4km zone between Prospects 128 and 160 are particularly strong and are expected to boost GPR’s maiden JORC resource beyond Prospect 150 alone. Additional targets including Prospects 170, 180 and 190 have also shown strong preliminary results and could therefore be added to GPR’s total resource. However, the reason why GPR stands out on the ASX is not only because of its promising drilling results, but its uncanny ability of knowing where to strike. 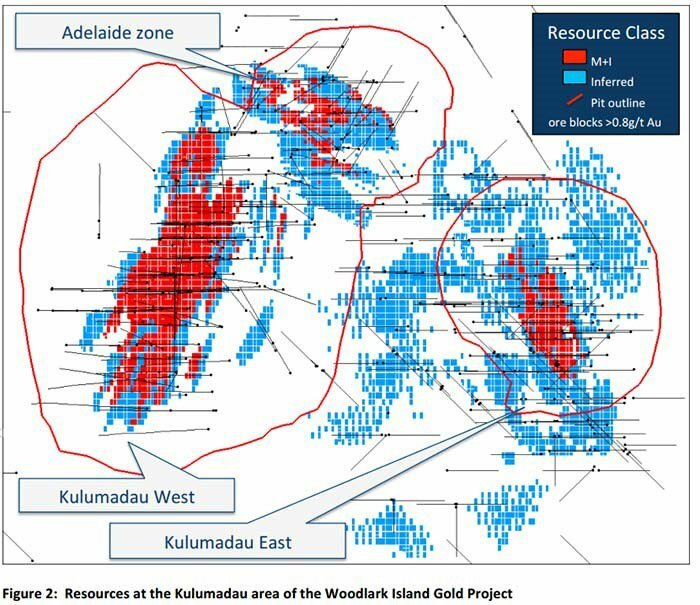 Here’s a quick fact to make your head spin – Over 80% of drill holes at Kou Sa have struck mineralisation. In mining exploration terms, that’s absolutely astounding. So how has GPR managed to pull that rabbit out of the hat? It is able to use a novel combination of IP geophysics and geochemistry to accurately model where GPR should drill next. The data is crunched by a crack chargeability geophysics team, with the team able to produce a chargeability map to indicate where the copper, gold, and silver hotspots are likely to be. Below is a map indicating levels of ‘chargeability’ of the ore below the ground. Areas shaded in white/red indicate the highest chargeability, which tends to indicate that highly conductive metals such as gold, silver and copper are sitting close by. The drill results achieved by GPR to date have proved the accuracy of this technique, consistently achieving significant mineral hits in these areas. During an interview with small-cap focused news site Finfeed.com , GPR managing director Ron Heeks said the large correlation between what was shown on the map and drilling was down to both the crack team and the larger-than-usual presence of sulphide. “At Kou Sa, we’ve been very fortunate, as well as having a highly skilled technical team working with us. 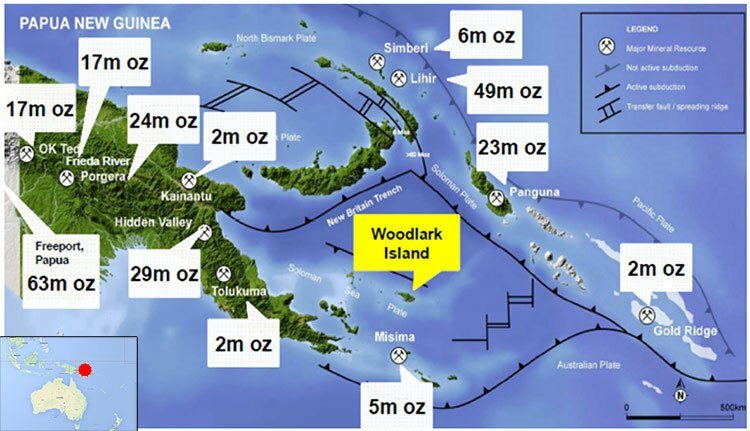 The mineralisation we are focusing on has a particular sulphide density which makes our chosen geophysics technique all the more effective,” Heeks said. “Some of the credit for the geophysics results should go to our geologists and some to Mother Nature for creating a mineralisation style with all the right tell-tale signs for our geophysics to pick up. The geophysics is also important in being able to predict the potential upside of the project, meaning it will be more efficient, more accurate, and more timely with a JORC resource. Given that over 80% of drill holes have hit mineralisation using the technique, GPR has a great degree of certainty over what’s under its feet. GPR is keen to locate the most optimal areas to base its Scoping Study on and ultimately where to start production – with the help of IP geophysics that process is being made easier, faster and cheaper. Just last week, GPR put out a release to the ASX with a very interesting theme. Despite being considered in the ‘advanced exploration’ category of prospects and not generally thought to be part of the initial resource estimate coming early next year, recent drilling had changed GPR’s thinking. This, it said, would allow it to fold the new and previous drilling into an initial resource estimate. 3m @ 1.11% Cu eq. from 62.7m. Significantly, the latest round of drilling, which was deeper, encountered strong rock alteration and mineralogy including epidote, haematite, and magnetite. You don’t have to know what that all means, but GPR said it “suggests that the zones are closer to a hot deeper mineralising source”. The above shows the various levels of zones the current and previous drilling has found at 170. Interestingly, a lot of the sulphide mineralisation veins remain open along both directions, meaning there’s further potential there. 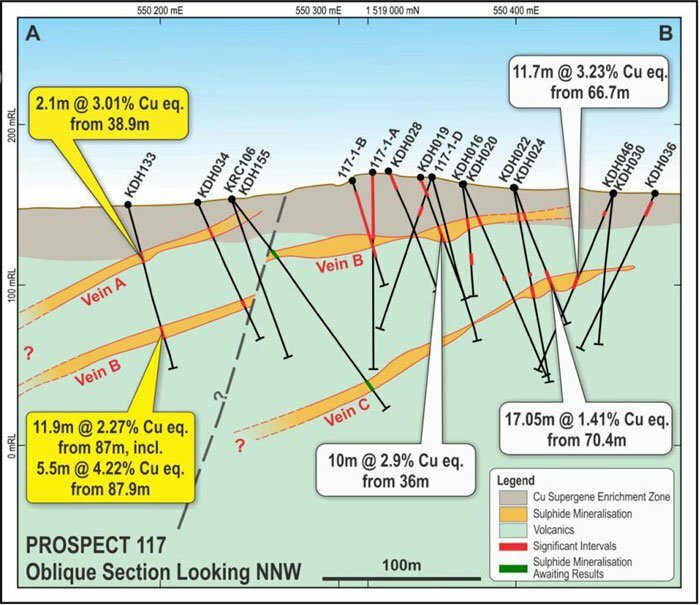 Just over a week ago GPR told investors that ongoing drilling at Prospect 160 had identified an extremely thick zone of copper-sulphide mineralisation which forms the central core of the overall mineralised structure. What was better, is that the first deep hole encountered 38m of mineralisation and a subsequent hole of 40m of mineralisation, just 40m from the surface. Here’s the thing though – the drilling of both holes had to finish early because of technical difficulties . That’s not normally great news, but given the holes finished in mineralisation it throws up the possibility that mineralisation could extend deeper still. Remember, this is the prospect which is thought to be one of the key prospects informing the initial resource early next year. Any extensions here could flow onto the initial resource, which could spell big numbers for GPR. “Recent drilling at prospect 160 confirmed our understanding of the style of mineralisation in the area. Allowing us to target drilling unto what is a considerably thicker zone of mineralisation that plunges to the north-west,” Heeks said at the time. The emphasis was added by us, but it’s certainly the kind of bullish talk we like to see. While in the case of many other companies it may simply be bluster, remember this is the company with the “Midas touch” and the crack team of geologists who have an uncanny knack for finding mineralisation. We’d back them to have a fair idea of what’s going on at Prospect 160, and if the company is putting these statements out there, who are we to argue. However, we should note that this still is an emerging mining company so the ultimate chance of success is up in the air – it is recommended that investors seek professional advice before choosing to invest. With the technical work covered off, it’s time to look a bit closer at its relationship with the Cambodian government. Those investors among you who have been investing in the resources game for a while would know that rocks are only really one part of the equation. A huge part of it is the relationship the company has with the authority in the area in which the company hopes to mine. Setting up a mine and all the exploration work which comes with it is a fairly intensive process and you need local partners to make it work. The presence of the Royal Group in the joint venture has opened doors, and the relationship between GPR and the local government couldn’t be better. In fact, GPR is helping to write the resources code. “Metals mining is in its infancy so naturally there isn’t the same understanding of the industry, which we take for granted in more mining focused countries,” Heeks told Finfeed.com . He went on to say that CAMEC – the Cambodia Association for Mining & Exploration Companies, was helping the government establish mining standards. “Best practice mining legislation is something Cambodia has prioritised as one of its national economic objectives and we’d be very happy to see this happen and assist wherever possible,” Heeks said. However, despite a troubled past, the country has been stable for 25 years and is just starting to want to capitalise on that stability and foster economic growth. One of the key ways it can do that, is by encouraging mining companies such as GPR to set up shop. According to Cambodian industry watchers Open Development Cambodia , the government there has no firm idea on how many resources the country holds because there’s been a lack of exploration there. Hence, it’s trying to figure out just what it has under its feet before it goes out into the international market. Enter companies such as GPR. While GPR get access to a potential world-class resource, the Cambodian government gets exploration work done for it, so it can take that work to the international market and invite more miners to have a go. However, at the same time, Cambodia remains a frontier mining destination, and this does carry additional risk, so caution should be exercised before choosing to invest in GPR. GPR is one of the few companies with access to the raw potential that is the Cambodian mining industry. It is literally helping to write the book on mining in Cambodia. Its drilling continues to impress, and its crack geophysics team keeps on coming up trumps. GPR has a clear plan to commercialisation, and there should be plenty of drilling for investors to jump on between now and a declaration of a maiden resource early next year. Beyond that, it will seek to complete a Scoping Study which will help envisage the day when GPR becomes one of the first companies in Cambodia to operate a commercial metals mine.